From developing better housing in animal shelters to finding ways to make dairy cows healthier, the Animal Welfare Program has made significant advancements for the welfare of animals since its inception at the University of British Columbia in 1997. Recognized as a global leader in animal welfare education and research, the Animal Welfare Program works closely with animal care professionals and animal user organizations to find practical solutions to animal welfare problems. Students in the Program gain a broad understanding of animal welfare issues, and conduct research on specific problems arising from agriculture, research, wildlife, and companion animals. They go on to influential positions in education, business, government and the animal protection movement. 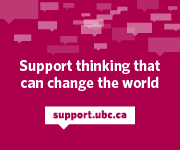 The UBC Animal Welfare Program has opportunities for people who care about the well-being of animals to support basic and applied research in this critical field.